← TRISTAN EDIS. How renewables trumped brown coal and gas over Australia’s summer. At first sight the South Australian election looks like a collapse of Xenophon’s SA Best Party and a stunning victory for the Liberal Party in taking office from Labor. But the reality is a little more complicated: SA Best is still a strong political force, and the Liberal Party’s vote has actually slipped. Before the South Australian election there was a widespread expectation that Nick Xenophon’s SA Best Party would emerge with a clear balance of power, or even as the party with the highest number of seats. A Morgan Poll published two months before the election had SA Best support at 29 percent, just behind the Labor and Liberal parties whose support was in the low thirties. An earlier Newspoll, in fact, had SA Best outpolling both the main parties. As it turned out SA Best did not win a single seat in the Legislative Assembly, and after 16 years in opposition the Liberal Party took office with a small but workable majority. The media story became one of collapse of SA Best, and a triumph for the Liberal Party. And triumphant it was. After Premier Weatherill had made a dignified and low-key concession speech, it was Premier-Elect Marshall’s turn to mount the stage – but not straight away. His carefully choreographed performance involved a slow meander through the cheering crowd, followed by an aggressive piece by a rock band, before he took to the microphone and gave his speech – a promise for “a new dawn, a new dawn for South Australia”, with a pledge to “transform” the state. Unsurprisingly he failed to acknowledge the contribution the Labor Government had made towards modernising the state’s energy sector, or the contribution the Federal Coalition had made in closing the car industry – both transformational in their own ways. Nor did he thank the Australian Hotels’ Association for their vicious campaign against the SA Best policy on poker machines. Beyond the hype the reality is a little more complicated. SA Best is in reasonably good health, and the Liberal Party’s support – both its primary vote and its two-party vote – has fallen. In the seats it contested its vote ranged from 11 per cent (Croydon in inner northwest Adelaide) up to 26 percent (Giles which includes Whyalla and a large slice of the outback). In the Legislative Council, elected on a proportional basis, it won 2 of the 11 seats up for election. In order to pass legislation blocked by Labor, Marshall’s Liberal Party will need support from either the Greens or SA Best. SA Best, therefore, is still in a position to exercise influence. 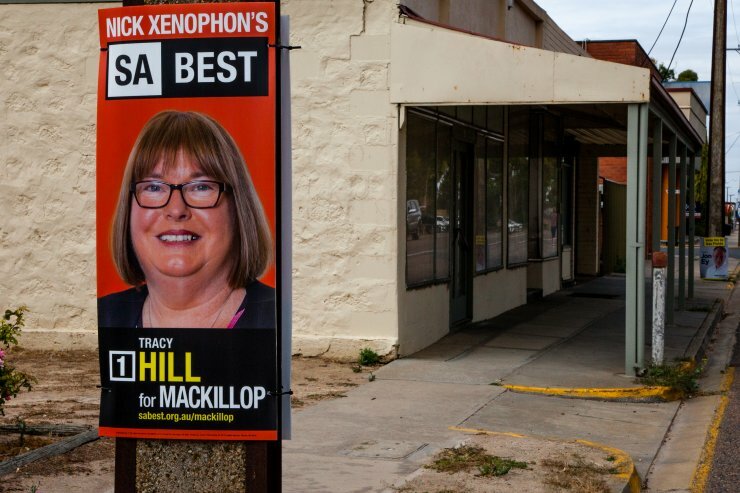 I was in South Australia at the time of the election, and gained the impression that while people were showing the now common dissatisfaction with the two main parties, many felt that apart from Xenophon’s proposed reforms of poker machines, they didn’t know what SA Best really stood for. This perception is understandable. As a Senator, Xenophon may have left people feeling that he and his colleagues were too easily swayed by government pressure to support poorly considered legislation, such as repeal of the carbon tax. Similarly the party’s website on state policies lacks any statement of ideology or even of unifying principles. Rather it is a collection of common-sense administrative proposals, which may be appropriate for a local government election, but which does not convey a coherent vision or a perspective from which one may compare the policies of SA Best with those of other parties. SA Best has done well for a new party, but if it is to build on its base it has to articulate what it stands for. The Liberal Party’s primary vote was a miserable 38 per cent. It was clobbered by SA Best, but it recovered ground on preferences from SA Best voters and from some other parties. It appears that it has won about 51 per cent of the two-party vote. But that is still a negative swing of about 2 per cent compared with the previous election in 2014, when it won 53 per cent of the two-party vote but failed to gain office. Under legislation that is perhaps unique to South Australia, the State Electoral Commission is required after each election to re-draw boundaries to provide some protection against the possibility that a party which wins a majority vote actually loses the next election. This legislation was in response to outrageous distributions that had kept Labor out of office in the 1950s and 1960s. In this instance, however, it has helped restore electoral justice towards the Liberal Party, because after the 2014 result the Commission re-drew boundaries to ensure that the Liberal Party would not see so much of its vote wasted with huge margins in safe seats. So the reality is that the Liberal party won in response to correction of an anomaly, and in spite of a swing against it. Celebration of election wins, triumphal bluster and self-congratulations may prop up party morale for a time, but they cannot compensate for what is starting to look like an established decline in voter support. And as a coda to the election, after a collapse of the Australian Conservative vote, that party’s one member in the Legislative Council, Dennis Hood, has joined the Liberal Party. Just as Turnbull is dealing with a hard right faction in the Federal party room, Marshall is going to have similar problems in the South Australian party room. continue to tolerate that, given how easily the electoral system could be adjusted to prevent our address being so important. This is a very sensible commentary — and explains well the unique SA legislative imperative about matching votes to parliamentary representation. It’s neither a bad result for the ALP (after 16 years in office) not any sort of “triumph” for the Coalition. Mr Marshall’s election-night performance would not give level-headed Coalition members or voters much optimism about a second term for their party.